out of doubt » Blog Archive » What is it? Is it the start of a wasp nest? Is a queen wasp in there somewhere? I took the picture last year just before this particular field was cut for hay. Thanks to Fanackerpan for giving me the answers I needed. Here are some links I found explaining further. 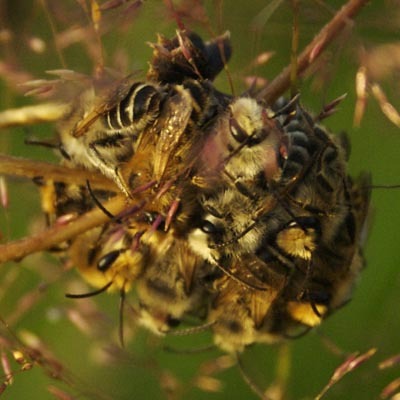 Science news have Balls of Fire: Bees carefully cook invaders to death. This entry was posted on Tuesday, February 20th, 2007 at 12:35 pm	and is filed under photograph. You can follow any responses to this entry through the RSS 2.0 feed. You can skip to the end and leave a response. Pinging is currently not allowed. If anyone has any idea what is happening here, I’d love to know so please leave a message if you have the slightest guess. I think these are bees, not wasps. I have witnessed this before whilst walking my dog. In some species of bee ( asian) this is a method used to kill predatory hornets. The bees surround the hornet and move their wings very fast, building up heat to over 47 degrees celcius. This literally cooks the hornet to death. Thank you for your comment. It’s just what I needed. I’ve added an update with a couple of links to articles. thanks!